He may be older. He may not be as quick as he once was. He also may not be as durable. Yet 49ers cornerback Richard Sherman, 31, who is entering his ninth season in the NFL, is still a very good player and one the Niners can use as a building block for a re-made defense in 2019. 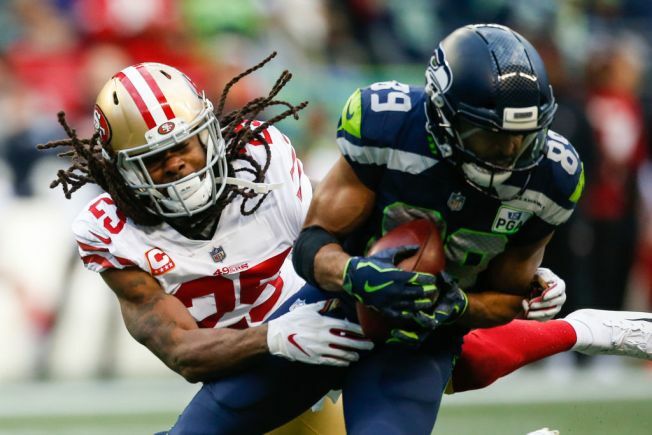 Sherman played his first season with the 49ers in 2018 after coming from the Seahawks, where he was three times selected first-team All-Pro. In 2018, Sherman played 14 games – after coming off a serious Achilles’ tendon injury. Though he had no interceptions, opposing quarterbacks often stayed away from his side of the field. He had four passes defensed and was in on 37 tackles. Recently, Daniel Rymer of the analytic website Pro Football Focus, graded Sherman among the best five cornerbacks in the NFC West. At 68.9, Sherman’s grade is below only those of the Rams’ Nickell Robey-Coleman (82.6), the Cardinals’ Patrick Peterson (82.5), the Rams’ Aquib Talib (76.6) and the Seahawks’ Justin Coleman (69.3). Sherman was targeted with throws just once every 12.6 coverage snaps, noted Rymer, “making him the most avoided corner in the NFL” in 2018. Sherman also allowed just 0.72 yards per cover snap, tied for seventh in the league. Plus, the 49ers believe Sherman – based on the way he helped others last season – will help the defense grow in 2019 with his leadership and knowledge. He was even better than he was believed to be.